These monster hats can certainly be made for any child or any adult for that matter. When my 10-year old saw me making one, he asked for one of his own. To make these monster beanie hats, follow my Basic Beanie Pattern. 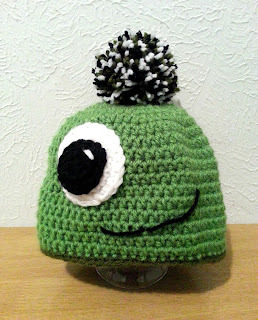 Sew the black center to the white and then sew the eyes to the hat. To make my pom-poms, I use a Clover Pom-Pom Maker. You certainly don't have to have a pom-pom maker to make pom-poms. Before I finally caved and bought the Clover maker, I used a piece of cardboard. I took an empty cereal box and cut a strip of cardboard from it that was about 2 ½ inches wide and 4-5 inches long. Wrap your yarn around the narrow side a bunch of times. You want it to be pretty thick so your pom-pom ends up looking full. Slowly slide the yarn off the cardboard and tie a piece of yarn tightly around the center of the ball.Tie it a few more times to make sure it won't come undone. Cut all your loops and give it a little shake to fluff it up. Use the strands you tied the ball together with to attach the pom-pom to your hat. Using black yarn, stitch on a mouth just off to the side. 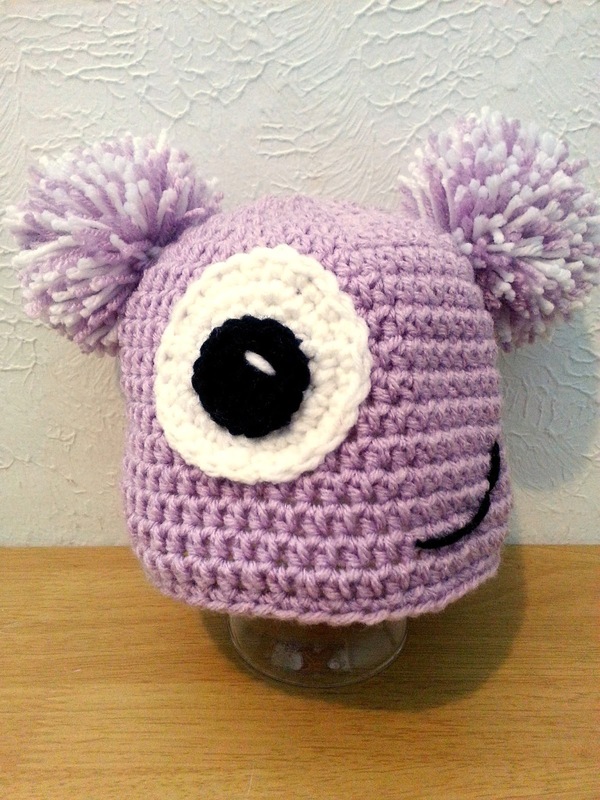 The fun thing about these hats is you can make them look however you want! 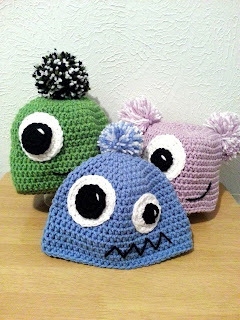 Use one pom-pom or two! 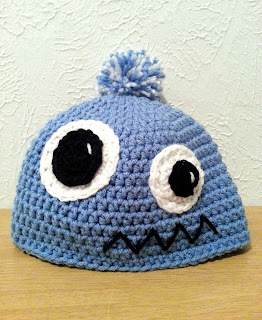 Make your monster happy, scary or any other mood you like. One eye or two - the choice is yours! !